Begin your journey in Cape Town exploring its cosmopolitan streets tucked beneath Table Mountain before setting sail along South Africa’s coast. Choose from specialty dining venues and a splendid collection of fine wines during a day at sea. Awaken in Port Elizabeth to discover its storied history along the Donkin Heritage Trail. In Richards Bay experience an authentic safari adventure at Hluhluwe-iMfolozi Park, home to Africa’s ‘big five’ animals and the largest white rhino population on Earth. Celebrate Christmas day at sea before an excitement-packed late stay in Richards Bay. Take the time to relax with an overnight in Durban. Enjoy the golden sand beaches or take a once-in-a-lifetime tour of traditional Zulu homesteads. From the town of East London uncover the white-sand beaches and dunes of the Sunshine and Wild Coasts before heading for the home of the largest flocks of flamingos in the whole of Southern Africa in Walvis Bay, Nambia. Celebrate the arrival of the new year back in Cape Town, and take the time to get to know this capital city set on two oceans. Learn more about the city’s dark past and Apartheid History. Uncover limitless outdoor adventure from mountain peaks to rugged coasts. Cheers to a bucket-list-worthy voyage from the world-renowned Cape Winelands. This is one holiday you won’t soon forget. Journey to South Africa's Mother City and experience the vast beauty of a land shaped by two oceans. Stunning mountainscapes and miles of coast provide limitless outdoor adventure, while world-renowned restaurants, a booming LGBTQ community, and the outlying Cape Winelands make Cape Town a contemporary, cosmopolitan city with a global feel. Perched across from beautiful Pelican Point, Walvis Bay is naturally sheltered from the rugged surf stretching north up Namibia’s coast. Venture inland for an exotic African safari, stroll the Esplanade and see echoes of a German colonial past, or relax on the boardwalk at a cozy cafe or restaurant with sweeping views of the harbor, massive lagoon, and calm waters home to diverse marine life. Relax and reflect on your journey thus far with a few days of fun at sea. Get a behind-the-scenes look at life onboard with an Insider’s View Tour, attend a destination lecture to learn more about your next port-of-call, or try your luck at our onboard casino. Want to really unwind? Watch the world go by and sip a complimentary drink poolside, or say “ahh” with a visit to Sanctum Spa. This five-night, all-inclusive post-cruise package introduces you to two very different sides of South Africa. First, you’ll explore South Africa’s wine region, sipping on excellent local vintages paired perfectly with gourmet meals and snacks. Once you’re fueled up, kick things up a notch with exciting game drives in Kapama Game Reserve, home to more than 40 mammal species (including the most dangerous Big Five!) Through it all, you’ll enjoy luxurious hotel and resort accommodations, plenty of leisure time to relax, and all the thoughtful amenities that make every Azamara Club Cruises® Land & Sea Package special. Begin your wine-and-dine day at Somerset West, where you’ll sample wines from Vergelegen Estate and learn about the estate’s 300+ year history. Next, head to Morgenster Estate to sample wines, olives, and olive oils. From there, enjoy lunch at Tokara Restaurant before one last stop on the tour: Anura Estate, where you’ll pair wine samples with award-winning, hand-crafted Forest Hill cheeses. Still hungry? You’ll be back at the hotel for dinner. 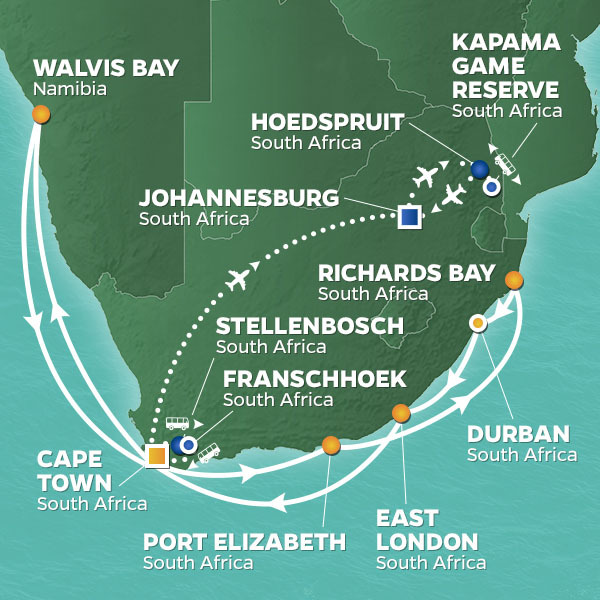 In the morning, transfer to Cape Town Airport for your flight to Johannesburg, where you’ll hop on a connecting flight to Hoedspruit. You’ll be transferred to the Kapama Game Reserve, home to more than 40 different mammal species, including the most dangerous Big Five: the elephant, lion, leopard, buffalo, and rhinoceros. Relax in the open, airy Kapama River Lodge, enjoy a decadent high tea, then head out with your ranger and tracker for an afternoon game drive, complete with sunset cocktails. 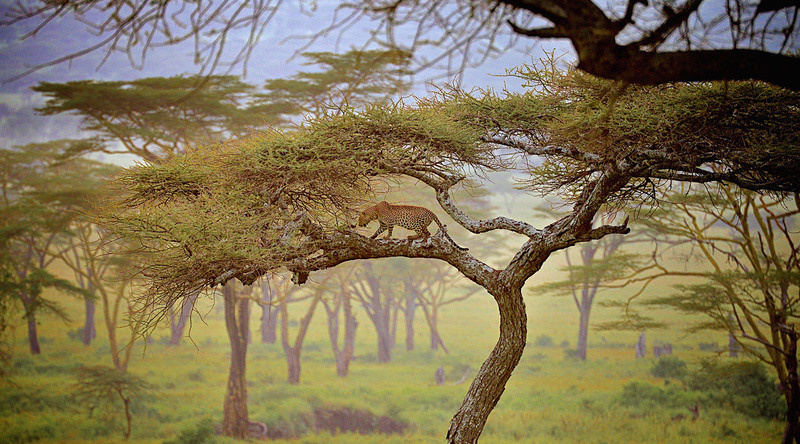 Wake up early for a daybreak game drive and spot the animals while they’re most likely to be active. After breakfast, enjoy a leisurely morning and afternoon (your safari director can help you arrange afternoon leisure activities) before another sunset game drive, where trackers will use the spotlight torch to see the nocturnal animals that come out to hunt. Return to the lodge for a delicious dinner. Enjoy one last early morning game drive before breakfast and your flight to Johannesburg. Once you touch down, transfer to the Michelangelo Hotel. With world-class amenities in an elegant, stylish setting just steps from some of the city’s best shopping, dining, and entertainment, it’s a tranquil retreat in the heart of the South Africa and the ideal spot to unwind after an exciting holiday. After breakfast, transfer to Johannesburg airport for your flight home. Introducing a new way to see the world with Azamara Club Cruises®. With our Club Veranda Plus Staterooms, enjoy spectacular ocean and destination views, plus a host of guest-favorite amenities—all at a great value. Everything you love about our Club Veranda Staterooms is included, plus extra perks and amenities to elevate your time on board. Climb into an open-top 4x4 vehicle for a rough and rugged safari to spot the "Big Five" deep within the Pumba Private Game Reserve. Journey to the Shamwari Private Game Reserve and enjoy a dawn, day, and dusk safari in search of Africa's big five: lions, leopards, rhinoceros, elephants, and buffalos. This three-day adventure gives you countless opportunities to spot Africa's elusive big game animals within a reserve celebrated for its conservation efforts. Meet knowledgeable rangers who will take you in search of African wildlife and enjoy the incredible amenities of the luxury Bayethe Tented Camp, treating yourself to delicious food or a game walk at one of the two Born Free Big Cat Sanctuaries. Travel from Richard's Bay to the Phinda Private Game Reserve for an evening and morning safari in search of Africa's big five. The Phinda Private Game Reserve is part of the greater St. Lucia Wetland Park, an UNESCO World Heritage Site. During your two game drives, keep on the lookout for lions, leopards, elephants, black and white rhinos, and buffalos. You'll spend a relaxing evening in the luxurious Phinda Mountain Lodge in a private suite with your own veranda overlooking the bush. Take a dip in a your private plunge pool, take afternoon tea on the patio, and enjoy dinner under the stars.